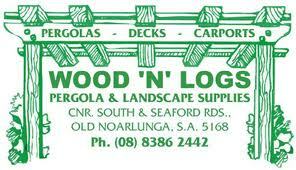 The team at WoodNLogs are the experts you should choose when looking for pergolas Adelaide. Their landscaping and outdoor lifestyle store has a huge range of wood, timber, decking, soils, in fact, everything you might want to buy to make your yard more liveable and enjoyable. Being the experts in their field, and a trusted, family owned and run business for 20 years, they knew for them to get more out of their internet marketing, they needed to find a professional in that field. They knew they needed to rank better for search terms like Pergolas Adelaide but how to do it..
Luckily their website designer knew Website Essentials and we were pleased to help. With a joint campaign on search to rank organically, grow their places and circles, and be strategic with their adwords, it was quickly ascertained what terms were the most voluminous and had the most value. One of these terms of course was Pergolas Adelaide. Identifying the right words based on actual, and factual search volumes in the local geographic area is the most important first step. Many can waste precious months on SEO on the wrong keywords. Many low volume long tail terms are great for show and tell and for long term trickle of visits, but in this case, Pergolas Adelaide was the one they needed based on their other rankings on other terms. We set about refining their site, getting their registrations sorted out and initial housekeeping SEO wise, and at the same time re did their adwords to make it 2013 compliant. Then it was down to the nitty gritty to get them ranking better than 27th for Pergolas Adelaide. We look forward to working with them to grow their online business on search, places, and circles. If you need a Pergola, go to Wood N Logs.